In yesterdays post I wrote about the origin of Mystery Babylon. It is the spiritual power behind every false religious system known to humanity. As you know, in the beginning there was a common knowledge about the one true God. Shortly after the fall, and mans expulsion from the Garden, another religious system arose–the way of Cain. God intended for man to offer animal sacrifice as a temporary cover for his sin. Yet Cain offered not the proscribed sacrifice but the fruit of the ground–the product of his labor, an offering of his own choice, a bloodless offering. According to the text, God refused the offering of Cain but encouraged him to do well, otherwise the sin in his heart would overtake him. And the LORD said unto Cain, Why art thou wroth? and why is thy countenance fallen? If thou doest well, shalt thou not be accepted? and if thou doest not well, sin lieth at the door. And unto thee shall be his desire, and thou shalt rule over him (Genesis 4:6-7). As you know, Cain refused the counsel of the Lord and killed his brother Abel. Cain left the presence of God and went to the Land of Nod which means “wandering, or exile;” it is the permanent state of those who refuse Gods way of salvation and choose instead their own way. In the process of time mans religious proclivities drove him to develop various gods and systems of worship which drastically differed from what God originally intended. To make matters worse, a group of fallen angels invaded the planet and brought corruption and ruin to the human race (Genesis 6). The resulting judgment of God caused the flood to overtake the antediluvian world during Noah’s day, wiping out sinful humanity and the hybrid creatures called Nephilim. 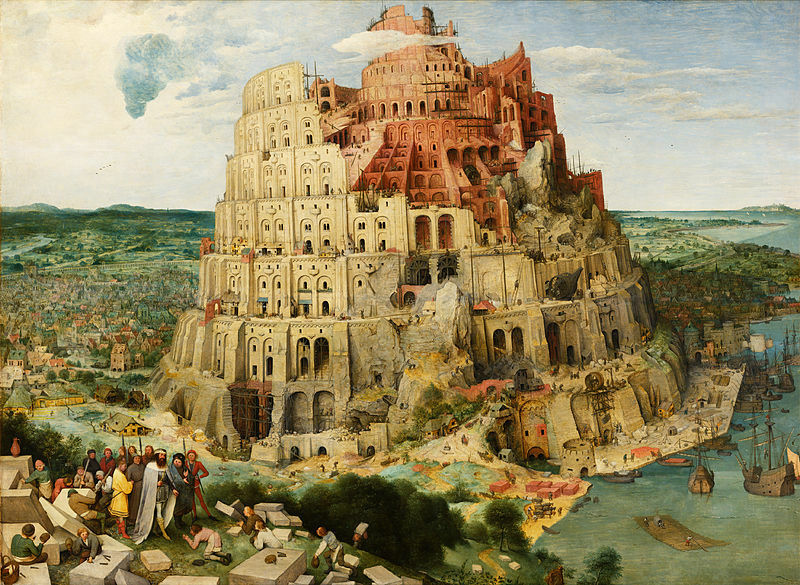 After the flood, men once again refused the way of God, and so under the leadership of Nimrod they began to construct the Tower of Babel, which means “Gate of God.” In other words, it was the intention of Nimrod to establish contact with the pre-flood deities through a spiritual gate or portal at the top of the Tower, so that humans could once again join with the “gods” and partake of the genetic nature of fallen angels to become like the Nephilim, the mighty men or gods of the pre-flood world. And this brings us to the present, because men are still constructing towers to reach into the heavens in order to contact God on their own terms. The dark truth of the matter, indeed, the hard truth, is that they are in contact with spiritual powers, but the one’s that the Apostle Paul warned about in the sixth chapter of Ephesians. For we wrestle not against flesh and blood, but against principalities, against powers, against the rulers of the darkness of this world, against spiritual wickedness in high places (Eph.6:12). Isn’t it interesting to see some of the developments in the ecumenical movement? The ringleader of all of this is the Vatican. Ask yourself, how many once strong Protestant denominations are now only weak, watered down shells, and how many once strong Evangelical churches and leaders now capitulate to the overtures of the Holy See? I was not surprised when a video taken by the late Episcopal Bishop Tony Palmer surfaced at a convention with Kenneth Copeland. The video is of Pope Francis delivering a conciliatory message to Copeland and other Evangelical and Protestant leaders. The overtures of Rome never end. The result is that Copeland, James and Betty Robison, Rev. Geoff Tunnicliff, Rev. Brian Stiller and Rev. Thomas Schirrmacher, of the World Evangelical Alliance, and John and Carol Arnott, of the former Toronto Airport Vineyard joined the Pope in Rome for a three-hour meeting and lunch. Later Joel Osteen and others also met with the Pope. These are actually startling developments for those watching who are aware of church history. Rome has not changed her stance about Protestants and Evangelicals, and other Bible believing Christians. Her anathemas still stand that repudiate your and my faith in Christ alone–that salvation is obtained by faith alone in Christ because of his substitutionary death on the cross at Calvary. The Roman Catholic church convened the Council of Trent in 1545 in an attempt to counter the doctrines raised and supported by the Reformers. The Roman response to Luther and the other Reformers was to “curse” them (let alone kill them when they could). They used the biblical word “anathema” which is a curse from God. In other words, those who disagree with Roman Catholic Dogma are, according to these statements cursed by God–but in reality the curse only comes from Rome and the dark spiritual powers that control and drive her. Canon 33: “If any one saith, that, by the Catholic doctrine touching Justification, by this holy Synod inset forth in this present decree, the glory of God, or the merits of our Lord Jesus Christ are in any way derogated from, and not rather that the truth of our faith, and the glory in fine of God and of Jesus Christ are rendered (more) illustrious; let him be anathema. You see, Rome has not changed, and for Protestant and Evangelical leaders to believe otherwise is to be deceived and to deceive others. Rome has never, and will never, repudiate or repent of the Council of Trent, she cannot. To do otherwise would be to admit she is not infallible. And by the way, the church that Pope Francis was talking about aren’t the Baptist folks down the street, it’s the Roman Catholic Church–for him, and others, there is no other church. The Jesuits have been working hard to bring the “separated brethren” back home–to Rome. And don’t forget that Pope Francis is a Jesuit. Friends, it does not matter what the developments in the ecumenical church world become now or in the future, don’t fall for it when the “walls” come tumbling down between Rome and Protestant, Evangelical, and other church bodies. Always maintain your distance from this movement. It is dangerous and will lead to deep spiritual deception in the last days before the Tribulation and the return of the Messiah. Personal salvation is not found in any church, it is only found in Christ–for there is no other name under heaven given among men whereby we must be saved (Acts 4:12). And Jesus answered and said unto them, Take heed that no man deceive you. For many shall come in my name, saying, I am Christ; and shall deceive many. And many false prophets shall rise, and shall deceive many. Then if any man shall say unto you, Lo, here is Christ, or there; believe it not. For there shall arise false Christs, and false prophets, and shall shew great signs and wonders; insomuch that, if it were possible, they shall deceive the very elect. Behold, I have told you before. Wherefore if they shall say unto you, Behold, he is in the desert; go not forth: behold, he is in the secret chambers; believe it not. If you are interested in learning more about the strong delusion of the last days then I recommend my book to you, Alien Antichrist, The Terrifying Truth about UFOs and Aliens, Antichrist, and the End of Days. For your convenience you may click the book link at the upper right side of the page; that will take you to Amazon. You can also get the book at Barnes and Noble as well. The book explains the critical role that the church of Rome will play in the last days as a Pope becomes the biblical False Prophet. It is my opinion that a Pope will lead the world to accept the aliens as gods once true alien disclosure takes place. That is why the Vatican and her astronomers are making statements about aliens, alien contact, and baptizing aliens. They already see themselves as the mediators between God and man, and I believe they also see themselves as the intermediary between the aliens and humanity. Arm yourself with biblical truth before the deception occurs. Jesus said that the deception will be so great that if it were possible even the elect (those saved or born-again) would be deceived by it. For there shall arise false Christs, and false prophets, and shall shew great signs and wonders; insomuch that, if it were possible, they shall deceive the very elect (Matt.24:24). 4. Worthy News, no author named; Pope Stirs Controversy Amongst Evangelicals; http://www.worthynews.com/16807-pope-stirs-controversy-amongst-evangelicals.